Hounen Tsukioka, The Ghost with Open Arms (1882), in the National Musemu of Japanese History. Maruyama Oukyo was a Japanese painter known for realism and occasionally painting ghosts. The painter is rumoured to be the originator of representations of ghosts with no legs but I suspect that the tradition is far older. Ths shows the artist being shocked as a female ghost appears out of one of his own paintings, with the image coming to life. 1) The internalised other of the Japanese self looks rather than listens - it is the imaginary other, an eye in the sky rather than the symbolic ear of the Other. Hence, the Japanese self is in the visual, rather than linguistic plane. 2) The tabu (and perhaps the tabooed other) of Japanese culture is upon the feminine rather than the masculine. Hence Japanese horror focuses upon horrible women, while Western horror largely focuses upon horrible men. This photo, "The Ghost with Open Arms" links the two theories together. It shows a horrible woman coming out of the imaginary plane, female horror coming out the image. This theme is surprisingly popular in Japanese horror. Ringu, probably the most famous Japanese horror film of recent years features Sadako, a ghost or monster that emerges from the screen of a television set when playing a particular, haunted video tape. Izakayayurei ("Ghost Pub", 1994) is the story of a publican who promises his dying wife never to remarry, and then when he does his first wife returns as a ghost. In an attempt to have the first wife's ghost return to the other world, they are entrusted with a traditional Japanese scroll drawing of a ghost (as is being drawn in the picture above can be viewed here) which is said to be a portal to the other world. I think that there are a lot of ways that this might be explained. Freud, Mead and others claim that we must internalise the view of another in order to have self at all. The other of the self has to be hidden, for the self to be the object of identification. It is enevitable therefore that something needs to be hidded in the plane, domain, or medium of self-identification, but what? A hidden eye or ear? I don't think that there is any need for an image of the other but I am not sure. I think that the tabu bears upon the medium, image or language, itself. In order for there to be a human self, we identify with a self-represenation. But if we were aware that the self is only a representation, then we would not be able to identify. Hence, we must forget that it is only a representation. We achieve this by a tabuu on the medium of self represenation, pretendind that our favoured medium is essence in itself. Hence Westerners are inclined to claim that self is the dialogue that the self holds with itself, that ideas (not words) exist in minds, that words cut nature at the joints, and that grammar can not be doubted (e.g. "I think therefore I am" is indubitable). I wonder if Japanese people are similarly unaware of "the veil of perception." To what extent is everything that we see merely ourselves? This is a knotty question, and I don't think that there is a right answer. But those that see essence as idea, are inclined to believe that the world of vision ("res extensio") is a internal sensation and not "the thing in itself." Similarly in Japan perhaps, the word is seen as that chit-chat, and perhaps (a hypothesis) the image is seen to be out there and shared. Thus the return of the medium, the return of the image in Japan, and the return of the phoneme in Western culture, might be felt ot be horrible. The Japanese are not afraid of images as entities, but of the return of the image as veneer or the horrible "tain of the mirror". Does this form of horror also exist in Western culture, in the linguistic field? Recently I watched the American horror film, Emily Rose about a woman possesed by demons. It bears a strong resemblance to "The Excorcist." However I did notice that a central feature of the excorcism ritual was the attempt to find out the names of the entities that were possesing the woman. They were all men of course. But what was the significance of finding out their names? Till then they had been voices. Perhaps by finding out their names, perhaps, the horrible voice (phoneme) can be returned to the realm of language. This naming of the beast, theme can also be seen in the animation of the Wizard of Earth Sea. Perhaps there are also a prevalence of proffecies (language) coming true, horribly, in Western horror? The Shining is a good example of the horror of words in the Western tradition. I was truly horrified to find that Jack's book was simply made up of "All work and no play makes Jack a dull boy" written over and over again. I think that the repitition of the single phrase made the medium (the ink, the paper) return, allowing us to see it for what it is: a medium and not idea. And similarly at the climax, just before Jack says "Wendy, I'm home," his sun writes r3drum on the wall in blood, which is murder written backwards. This "redrum" may in a sense be the equivalent of Sadako in the ring, at first only "noise" a pattern of sound and images, becomes real...enter Jack with his axe. The word God (some prefer to write G_d) is often tabuu, and that the ancient Jews wrote it without any vowels YWH (Yaweh) so as to make it more difficult to pronounce. Some people write G_d, to thise day. Do not use the lords name in vain, for fear that you may realise that he is but a name? And then of course there is John, dear John. In the beginning was the word, and the word was with God, and the word was God....And the word became flesh and dwelt amongst us, says John. But this was far from horrible. Perhaps the realisation that Jesus is the word e.g. Jesus as myth hypothesis, is this sort of horror. This shows the side of a small street in Tokyo opposite an off licence (liquor store). I suspect that the corner of the road may be the private property of the shop even though it is covered in tar mac. 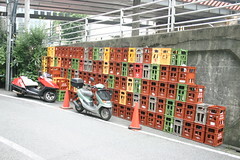 The shop keeper is using this area as a place to keep his and his wife's scooters, and about 100 crates, each containing four empty shouchuu (see below) bottles. I think that if someone left a large quantity of bottles on a street in London then some young men, returning from the pub would find it amusing to knock over the tower of crates and smash some of the bottles. Shouchuu is Japanese vodka. Containing only about 25% alcohol it is considerably weaker than Russian vodka. It is a distilled white spirit made from wheat, rice or sweet potatoes. In the past Shouchuu was a working mans intoxicant. It was consumed with hot water for, the maximum bang per buck. More recently however the existance of a great number of provincial shouchuu distilleries with a low volume of production, has created a new market, rather that which exists for "fine wines" made up of customers who covet the distinctive flavour and aroma of the various provincial brands. Would you be able to leave crates of bottles on a street in London? According to an OECD survey Japan has the second least crime of the 22 OECD coutnries surveyed, after Northern Ireland, as measured by the percentage of the population that have been a victim of crime in the past year - in japan 15.2% in Northern Ireland 15%. 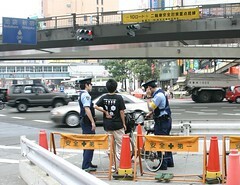 More than 30% of Japanese victims where victims of bicycle theft. This is hardly surprising because a lot of people do not even lock their bicycles up! This is a bicycle in Northern Ireland. Note the U Lock fixing the bicycle to a bench. While Japan has incredibly low rates of concrete, visible crime, it comes 18th out of the 22 OECD countries in terms of corruption. I am looking for figures on copyright infringement. I argue that this disparity is evidents of the fact that Japanese people are very much aware of the gaze of others, to the extent that they have externalised a generalised gaze. This means that they feel bad about performing visible and imaginable antisocial acts such as all the crimes listed in the first OECD victimisation ranking. Westerners on the other hand have internalised the ear of the other such that we find it painful to perform acts which are difficult to narrate in a non antisocial way. Hence crimes of corruption which often involve reprimandable linguistic acts, are more painful, more likely to arouse feelings of guilt among those from the cultures of the religion of the book - the West (and the Middle East, I am not sure why they are fighting each other). Many young, and not so young, Japanese women like to avoide ultra violet radiation and use umbrellas to shield themselves from the sun. The day on which this photograph was taken was cloudy but bright. Japanese generally believe that it is more attractive to be white skinned and have a word "bihaku" (literally "beauty-white") to express the state and colour of someone who has not been out in the sun. In the UK we call it "pasty." Some Japanese also explain that it is unhealthy to go out in the sun, since its rays produce premature aging although this is probably a secondary, long term rationale. Are You Riding a Stolen Bicycle? These Japanese police officers weres stopping cyclists at random, and checking that the id of the rider matched the registration of the bicycle over their walkie-talkies. In order to combat bicycle theft, bcicycle registration became a legal requirement about 8 years ago. From a very brief survey of the people that the police were stopping and checking, it would seem that they were concentratiing on those riding the standard, cross bar-less, shopping bicycles (mama-chari - mum's bikes). This suggests to me that the majority of bicycle theft is of such bicycles for the purpose of riding them rather than for the purpose of selling them to a third party. There are quite a lot of expensive mountain bikes and road bikes parked with flimsy locks, or no locks at all. But there are even more shoppers, without locks or with easily breakable built in front wheel locks (which can be twisted so that they do not interfere with the movement of the spokes. These bicycles are about 100 USD new in Japan. They are often abandoned even by their owners and large numbers of them are seen at rubbish collection stations on those days when "large rubbish" can be thrown away. 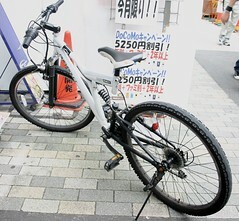 It is my perception that some Japanese people tend to see such bicycles almost as a communal resource. Some towns, such as my old town of Kurume, have organisations that provide bicycles - painted blue - at stations for free for public use. Perhaps the OECD statistics regarding the rate of theft of bicycles and the fact that bicycle theft represents 30% of crime as experienced by Japanese. 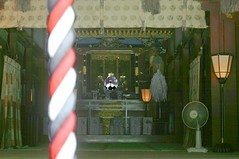 Sometimes when praying at a Japanese shinto shrine, one can see oneself reflected in the mirror at the back of the shrine. At other times one can see the reflections of those standing nearby, as in this photograph. I don't think that it is important that any one be reflected in the mirror. Indeed it is possible that it is better that the mirror is empty. There is a ooth in Japanese to the effect that God (kami) is a "mirror" (kagami) without "me" ( or self or ego = "ga"). I claim tha the mirror in the Shrine is of central importance for understanding Japanese culture and that the Japanese have internalised the view point of society as a mirror.